On this page is a S&P 500 Historical Return calculator. 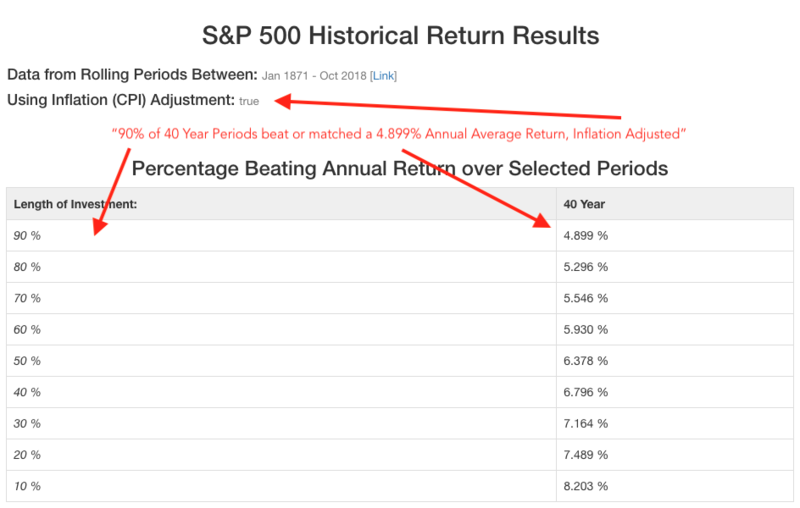 You can input time-frames from 1 month up to 60 years and 11 months and see estimated annualized S&P 500 returns – that is, average sequential annual returns – if you bought and held over the full time period. Choose to adjust for dividend reinvestment (note: no fees or taxes) and inflation. The results show a measure of volatility – the monthly realized historical volatility and annual realized historical volatility. Finally, if you select an ending month in the ‘Input’ tab, DQYDJ will calculate every period ending on that month – useful for historical period comparisons. For total returns over a particular timeframe do not use this calculator, use the S&P 500 Return Calculator instead. There are only three inputs you’ll need to think about before running the tool. There is no hard limit on the number of periods – select as many periods as you think your eyesight and computer will handle (or run it multiple times). Also: all returns are annualized, unless otherwise noted. This means you can directly compare results between time periods, but you will see unbelievable numbers for smaller time frames – a high monthly return looks even higher when annualized! To be clear: these are estimated annualized returns using your choices over the time-frame selected, not total returns. Adjust for Inflation (CPI) – Should DQYDJ factor in inflation, in the form of the CPI, for this simulation? Detailed Results for Period – If you select this, we will add another results table with an exhaustive record of all of your return periods ending in the month from this menu. We can see this being valuable for round number comparisons such as 1, 5, 10, 20, or 30 year returns where you’d like to see performance ending at a definite date. Using (CPI) Inflation Adjustment – Are these results adjusted for inflation? Calculating Dividend Reinvestment – Are these results including dividend reinvestment? Annual Realized Historical Volatility – Historical volatility for every year over year period. Summary Statistics – For every period you selected, DQYDJ calculates average, median, maximum, and minimum returns. We also compute a standard deviation of final returns over all applicable rolling periods. (Optional) Annualized Returns Ending… – This table will only appear if you select a month in the ‘Detailed Results for Period’ option pull-down. It will show an exhaustive list of every chosen period length ending on the month you selected. Ordered Sets of returns are graphed from the 2nd percentile to the 98th percentile of returns (after sorting). You can hover over lines to better see the returns. 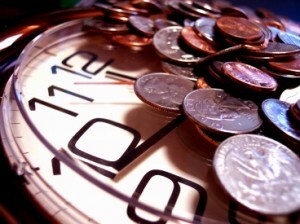 Time is money – as you can see from using this calculator! If you’ve seen our previous calculator on this subject, you’ve probably already drawn some conclusions about this data. 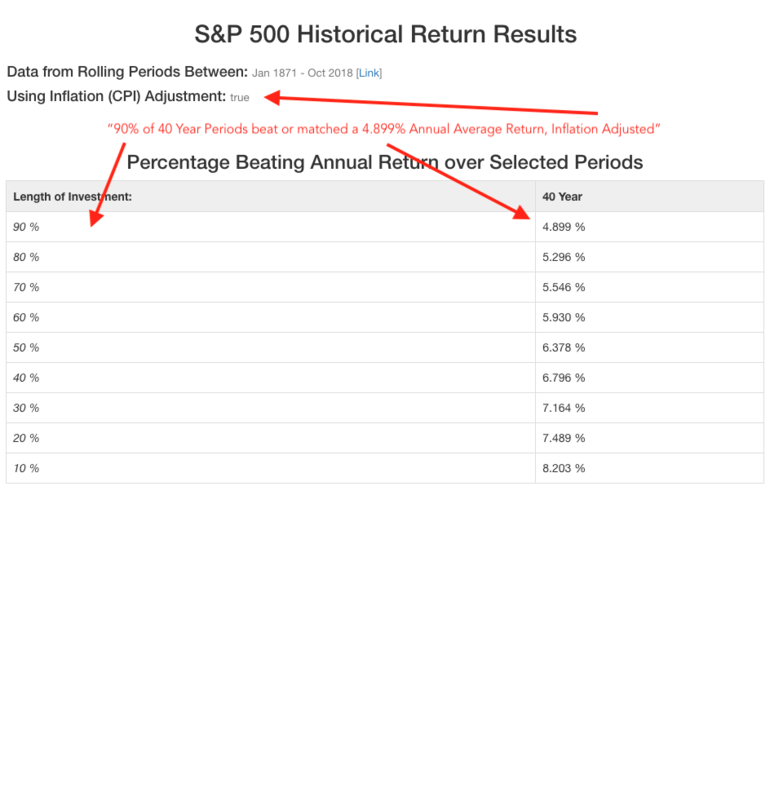 Let’s stress one main point for you again: the annualized returns look better and better the longer the time period you select. Remember though: past performance is no guarantee of future results. However, past performance is an excellent way to determine if your plans are reasonable. If you expect a 12% real return over a 40 year career it helps to know… that’s never happened before. A just-north-of-10% annualized real return is the winner, so far. Knowing what has happened in the past, though, is a reasonable guide for what might happen in the future. You’ll also note that the minimum 40 year real annualized return was a bit more than 3% a year (as we went to press). At no point over a 40 year career did the S&P 500 lose to inflation (thus far). We’ve even done some of that math for you already: see our theoretical examples on maxing out a 401(k) and maxing out an IRA. So, here’s all of the historical data for any time period you can dream up in an easy to use and re-use format. And if it’s the wrong format? Check out our other investment calculators, hopefully you’ll find something more up your alley! I left the calculator at the defaults, selected “Calculate Historical Returns” and looked at the charts. The curves looked interesting, but the labels on the y-axis were all showing 0% (both chrome and firefox on a mac). I’m wondering if it is clipped to only show 1 digit, or if the rounding settings should be updated? Thank you for finding that – it wasn’t treating the decimals as percentages properly and rounding them to zero. It should be fixed now (tested on the same browsers on my MacBook, the latest Firefox and Chrome). Should these returns be risk adjusted via t-bonds? Otherwise, why take the risk? The problem is that returns look more ‘predictable’ if one looks at the statistics of ‘annualized’ returns. This is an illusion though, as the volatility of the accumulated wealth actually increases and the ‘compounded’ returns become actually less predictable. The whole notion of “investing for the long term” is based on faulty statistical premises. Thank you for the link, but I’d disagree that the article or calculator are based on faulty statistical premises. Yes, for a given individual finances – or terminal finances at the end of some period – are more volatile ($1,000 in the market won’t swing as much as $1,000,000), but a lot of things become more complex as the number of figures in an account rises. Additionally, market returns aren’t the only source of funds, especially for an individual investor – we’ve demonstrated that in many cases savings rate is more important than market returns. This particular calculator is illustrating index returns, and our point probably shows best through the graphs. Volatility or not, take ’40 years’. From your article, you explicitly call out planning for the market average roughly ~6% real return, and our calculator is one of the few public facing ones that has higher resolution on returns instead of rolling it up into averages and medians. Instead of burying poor results, we produce an ordered set of returns (through the ‘Chart’ tab, and deciles on the summary page). Longer time periods provide a tighter bound on expected annual returns, and our calculations are based on what we’ve actually seen on the S&P (and Shiller’s reconstruction). So, yes, it’s best to plan for the lower end of the scale (~3.2% or 3.9% real over a 40 year career) than the ~9.6% – 10.3% or even the average ~6.4% real. But the math and the prose is correct – there were no negative periods in longer sets (e.g. holding 40 years never resulted in a loss, unlike 10 years), the longer period you pick the more tightly bound on the expected annual returns, and realized annualized volatility on the index was lower – exactly as we stated in the bullets. I realize I did not explain the case correctly. Yes, technically, your prose is correct. However, what is somewhat incorrect is to look at the statistics of the ANNUALIZED return to claim that an investment in equities becomes ‘less volatile’ and ‘more predictable’. These two claims are not true. The reason is that the statistics of the annualized returns does not account for the effects of compounding. When you include compounding, you find that the ‘accumulated wealth’ becomes more volatile and uncertain. In fact, the volatility of the accumulated wealth increases with time. The volatility increases at a lower pace, like the square root of time, but it increases nevertheless. While it is true that the chances of getting negative returns decreases over the long term, the chances of achieving the historical average 0f 9.6% do not improve with time. In fact, they always remain about 50%. So, no, RETURNS DO NOT BECOME MORE PREDICTABLE OVER TIME. In fact, quite the opposite when you look at the dollar value of your accumulated wealth. I know it is industry practice to show the statistics of the ANNUALIZED returns, but what matters for the investor is the statistics of the COMPOUNDED total returns, i.e. the accumulated wealth. In simple terms, I want to know what the potential final value of $1,000 invested for 10, 20 or 30 years will be. The range of possible final value increases with time and becomes less predictable. Then we’re using two definitions of volatility. I am using the finance definition – see the link in the outputs section. Wealth may be “volatile”, say between 2008 and 2009, but that’s a one year return. If you bought in January 2008 and waited until 2048 I’m almost certain you’d have a positive real return. There has never been a 40 year historical period where that wasn’t true. Maybe we can find common ground here and insist people plan on very small real returns for a career (~3.3% a year? If it’s more, great! You won! ), but what I can’t do is write with a straight face is write that people should expect the market to drop over 40 years (even the Nikkei is up since Jan-1977, in Yen and in Dollars). Advisors using Monte Carlo simulation are hopefully picking up the outliers anyway – if you only look at the average of the simulation you’re doing it wrong. Hope this helps. I’ll think about how to make a similar tool which also finds and applies the worst case return for an input scenario (and probably Monte Carlo at the same time, we’re currently lacking a MC tool). To prove that a median income family can save enough to retire early. to over 30 yrs, 20 yrs, etc. What if you lowered that to a 20% saving rate? 10%? Interesting question – let me chew on it and maybe I’ll put something together. We have a fair amount of that data here so a slight remix of the historical calculator should do it.